What will The Ridges look like 150 years from now? That’s the question community members gathered to answer at the Southeast Ohio History Center Thursday night for the sixth and final installment of the Athens Asylum Sesquicentennial Series. The Ridges Framework Plan co-chairs Shawna Bolin and Joe Shields recounted a brief history of the former Athens psychiatric asylum over the course of the past 150 years and revealed plans for the grounds’ future. Since Ohio University received the property in 1988, amidst renovations including the Voinovich School of Leadership and Public Affairs, there have been ongoing talks of tearing down some of the buildings due to asbestos concerns. That proposal was met with vociferous opposition from community members who have insisted The Ridges is an integral part of Athens’ identity. One such building, a former tuberculosis ward, was torn down in 2013 due to its deteriorating condition and the presence of trespassers. Bolin said she once worked at The Ridges as an OU student and fell in love with the history complex and its story. Nineteen years later, as the associate vice president for university planning, she is working on The Ridges Framework Plan that will stand for the next few decades and beyond. Setting sights on their future, Bolin and Shields discussed how The Ridges will evolve decade by decade. By 2020, once the current asbestos removal is complete, a ward wing of the main building will be renovated. The $14 million project will create open-office space for various departments, including the Ohio University Police Department. There are also possibilities of an outdoor museum to display the natural environment, as well as the start of ballroom renovation. The 10 years following will be focused on sustainable housing and establishing an eco-village, they said. By 2030, perhaps commercial development such as wineries and breweries will be built at The Ridges. As for the long-term future, plans are for the most part up in the air. Bolin and Shields poked fun and created their own vision for the future: one that included innovations such as jet packs and harvesting cells in research centers to cure diseases. Their outlandish suggestions elicited laughter from residents in the crowd, but in all reality, their ideas might not be too far off in 2168. Originally published on the front page of The Athens Messenger on Nov. 19, 2018. Have you ever heard the story of Mount Nebo? The story goes that an Athens County family by the name of Koons once operated a seance room in their log cabin. The Athens area is notorious for its allegedly haunted history and stories like this, and one local resident is bringing that reputation to life just in time for Halloween. Sharon Hatfield, an author from Alexander Twp., published a nonfiction book based on research that has taken her eight years to uncover. Her new book, “Enchanted Ground: The Spirit Room of Jonathan Koons” recounts the story of a 19th-century man who believed he could communicate with the dead through seances. This is believed to be the first time that research on this story has been compiled into a book. Though the book is driven by facts, it reads like a novel about Koons’ life. Hatfield spent years combing through historical accounts and drafting an entertaining tale. Koons and his family operated a log cabin seance room in Mount Nebo from 1852 to 1855. No photos of Mount Nebo are known to exist, though modern day maps place it near the intersection of Sand Ridge and Mill Creek Roads in Dover Twp., north of Athens. At first just locals attended, but soon people across the country were flocking to witness this spiritual experience. Though the practice was accused of being linked to devil worship, research shows Koons to be a religious man. Hatfield’s book describes him as a strong Christian who disagreed with many institutions of Christianity at the time, and he believed his communication with spirits further affirmed one’s belief in Heaven. As for the seances, Koons would welcome guests into his home and treat them to a song on his fiddle before blowing out a candle, dimming the setting to pitch black. Visitors reported seeing objects levitate and instruments playing notes without musicians. They also described seeing disembodied hands writing messages, though the author believes this was family members tricking the guests. Hatfield is celebrating her book release on Wednesday, Oct. 31 at the Southeast Ohio History Center from 5-7 p.m. The event is sponsored by the Ohio University Press, which also published her book. “The opportunity to publish a local story that combines empathy, a healthy dose of skepticism and first-rate research and that is genuinely illuminating and entertaining is as good as it gets,” said Ohio University Press Director Gillian Berchowitz. Enchanted Ground can be purchased at the History Center, Little Professor Book Store and on Amazon. Originally published on A1 of The Athens Messenger on October 31, 2018. Horseshoes clop, clop, clop against the bricks, manes flopping with each step, as one admirer after another approaches with a question not typically asked to other law enforcement officers. Yes, the handler tells a dozen or more every hour. Most college students steer clear of police on a night like this, but these mounted Athens Police Department units are the biggest and most popular on the block. 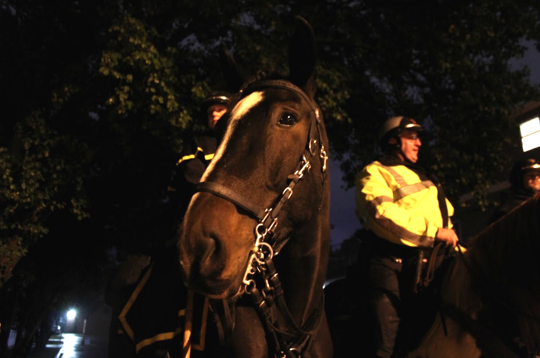 The mounted units are active during events expected to bring out large crowds, such as Welcome Weekend, Fest season and, of course, the annual Halloween Block Party. What residents and students may not know is the horses are actually owned by the officers themselves. Dicken has been a patrolman for APD since 1997, a year after the horse units first debuted in town. He owns three of the six horses on the force and cares for them on his 62-acre farm. In addition to their normal pay, the city pays officers like Dicken $12.50 per hour to “rent” the horses to patrol a given event. The city also pays for horseshoes and some other necessary supplies. While there is not a formal certification process, the city only employs horses considered well-prepared for joining the force. Dicken is one of three commissioner officers for the Buckeye Sheriff’s Mounted Association, which assesses horses through criteria such as obstacle courses, formations and handcuffing procedures. “We’re not going to put someone, even a horse, on our street who is not prepared,” he says. A student pets a horse on Mill Street. Photo by Abbey Marshall. Contrary to popular belief, the department allows students to pet the horses with them if they ask. It is only a felony if someone assaults the horse. 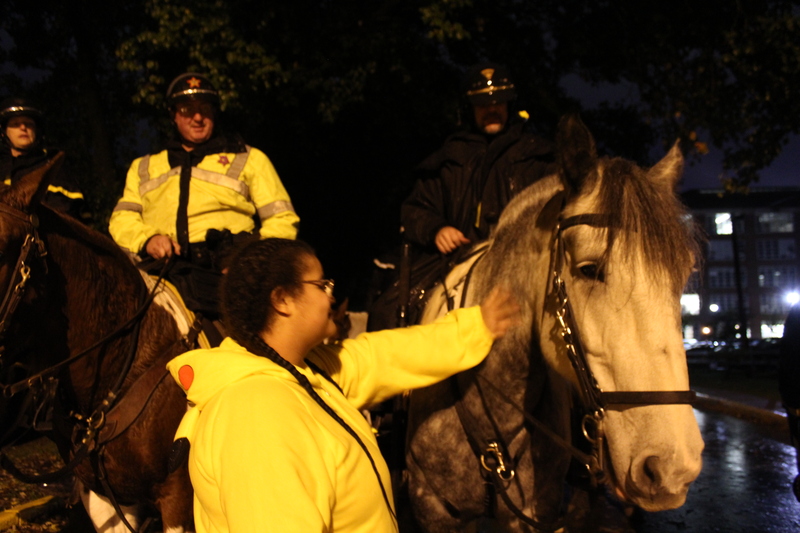 In that sense, the mounted units are utilized as much to encourage positive interaction as they are for safety purposes. Such units can be seen at BBQ on the Bricks, a yearly gathering meant to bring together the OU and law enforcement communities. Erica Pfannenschmidt, a sophomore at Ohio University, is one of the many students who made an effort Saturday night to say hello. Originally published on A1 of The Athens Messenger on October 30, 2018.